IBA Centre for Excellence in Islamic Finance (IBA-CEIF) is pleased to offer a two-day intermediate level course on "Risk Management in Islamic Financial Institutions". The course is designed for participants seeking an in–depth understanding of Risk Management in Islamic Financial Institutions. The course sets out to develop the concept of Risk management in Islamic Banking and then moves on to the practical aspects of application with demonstrations from case studies and interactive exercises throughout the program. 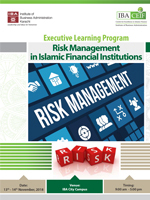 This is a comprehensive program designed to give delegates an all-round understanding of the issues involved in Risk Management for Islamic Banking.